The best stores – certainly in the modern luxury industry – have a sense of community. Trunk has that in spades, thanks to Hugo, Daniel and now Tim. Anderson & Sheppard (haberdashery) too. And digitally, no more so than The Armoury in Hong Kong. Such is the success of Mark, Ethan and co that we all somehow feel part of that community, despite being thousands of miles away. Judging from an all-too-brief time spent with the guys at the Armoury’s new store – in Tribeca, NYC – they are well on the way to achieving the same thing. This is particularly valuable in New York, where most of the competition for luxury clothing comes from department stores with often arrogant and commission-centred salesmen. Of course, the biggest benefit of The Armoury is the brands it brings to the city. Carmina and St Crispin’s shoes; Ring jacket and Orazio Luciano jackets; Liverano and Koji Suzuki bespoke. The guys say that, so far, there has been a big interest in made-to-measure suiting and the bespoke trunk shows. Perhaps this isn’t surprising, given the surfeit of ready-made clothing in New York but relative paucity of custom. These offerings require more education of the customer, but Jeremy, Zach and Nick (pictured left to right) certainly don’t lack an urge to do that. I clearly remember walking into Leffot the week it opened in New York, and seeing Steven every year since, as the store grew and evolved. It’s a lovely feeling, and builds the loyalty that so much menswear relies upon. I can only wish The Armoury similar success, and a community on a par with Hong Kong. You can follow the discussion on The Armoury, New York by entering your email address in the box below. You will then receive an email every time a new comment is added. These will also contain a link to a page where you can stop the alerts, and remove all of your related data from the site. Kudos to The Armoury. Do you know if they plan to expand the offerings of the online store at some point–for those of us unable to make it to the brick and mortar versions? Yes, we have already begun expanding and improving on thearmourystore.com. We can now fulfill from both our New York and Hong Kong locations, which prevents any duties from being billed to our North American customers. We plan on continuing to update the site both visually and in terms of content and product offering. Along with Ring Jacket and Carmina we have added products from Tie Your Tie, Liverano, Eidos and will continue to expand offerings from Drake’s, Orazio Luciano, Mattabisch, Nackymade, Sorley just to name a few. Brilliant, thank you. I very much enjoy the Armoury Lightbox and related Tumblr sites (like Ethan’s Rugged Old Salt) and hoped that many of the splendid offerings depicted therein would make it over to the online store. Greatly appreciate your response. Many thanks for your excellent site and even more so to the useful answers you give to direct questions. Speaking to the company that made it they’ve come up with two explanations, firstly the “heavy” (13oz) fabric has creased meaning the sleeves need letting down 1/2″ and secondly they say their block is a very high arm hole which is the main reason for the riding. I’m looking to get another suit made, struggling to get another M2M where I trust the sales person and so probably would stick with these guys. They have said they can have the arm hole made larger but that will make the jacket feel less comfortable but would solve the sleeve riding up issue. Does this sound like an armhole issue? Are there other solutions? Many thanks for confirming my suspicion, its a pity as I was otherwise happy with it but if they dont know the cause they are unlikely to be able to fix it. Unfortunately the other MTMs I’ve been to and had some confidence in their sales chaps have all said that their blocks arent suitable for my shape – though that wasnt the sole reason for trusting them. Guess I’ll keep looking as want to get another suit and replace my RTW odd jackets with MTM as they never fitted properly. Sorry, should have asked yesterday. Is there anywhere close to the City that you would recommend for alterations where they could possibly diagnose the root problem rather than simply doing what I instruct? I notice that the store carries Orazio Luciano clothing. Do you have an opinion on this line in terms of model design,workmanship etc? Thanks Simon! I’ve read some favorable reviews on the line and wnat to examine it when I visit New York next. 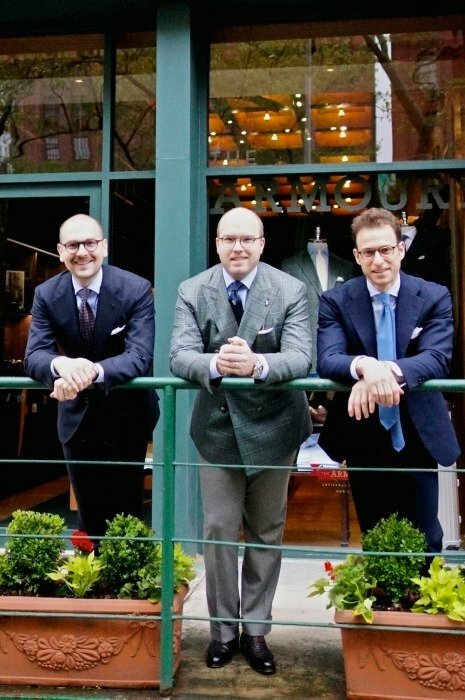 The Neapolitan model fits me best and I’ve been looking for a quality Italian line available in the United States that’s more reasonably priced than Kiton or Brioni with excellent model design and workmanship. I am a Swedish gentleman soon to be living in New York. During my last visit I visited the Armoury and was quite pleased with the store, the range that they have and above all the staff. I was serviced by Jeremy (I think from the pic above) and he was very glad to answer all my questions for future purposes. My question to you relates to my transitioning into the world of MTM and eventually bespoke, having been in the world of RTW up until now. Being a young man with a youthful appearance (I can’t even grow a proper beard!) I wanna make sure that as I progress into the sartorial world that I dress the part and don’t end up looking like my dad (who favors Armani) but maintain the look of a young, yet well dressed man. Do you have any recommendations for me to consider in terms of what to look for and where to find it in NYC (apart from the Armoury)? I think I should start with buying a base wardrobe and get good value garments that lasts. I should also mention that I am an artist so I am not a stranger to giving a bit of a twist to my outfits though stayin as well tailored as possible.